Here’s an excellent reason to consider using a recent version of Chrome or FireFox as your web browser when uploading videos to YouTube: Uploads are recoverable and resumable file transfers when using these browsers. This evening I uploaded two large, high definition videos to YouTube from this past weekend’s Trapper’s Rendezvous campout in southcentral Kansas. The first was a 788 MB, 10 minute “no-edit” video about Kansas during the Civil War years of 1861 – 1865. The second was a 1 GB, 13.5 minute edited video (an “iPhone documentary”) I created with iMovie ’11. During the upload of both videos, my high speed cable modem Internet connection went down for awhile and came back up. I’m guessing the upload stress of my continuing CrashPlan backup (260+ GB worth, running for more than a week) along with Netflix streaming by other members of my family caused the interruptions. Whatever the case, the fact that uploads to YouTube using the latest Chrome browser now RESUME when you cancel an interrupted download and choose to upload the same file is GREAT. But-for this YouTube feature, I don’t think I could have successfully uploaded and shared these videos online tonight. If you haven’t already, it’s time to ditch Internet Explorer, whether you use a Windows or Apple computer. 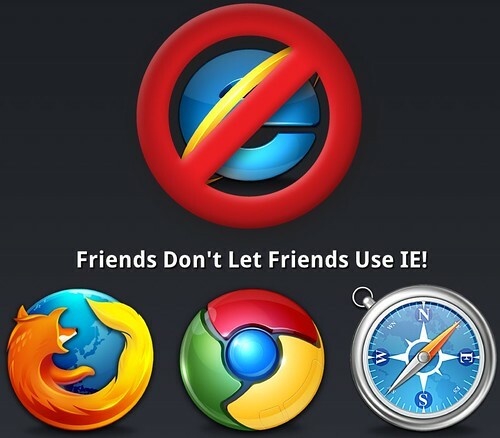 IE is slower, has poorer support for web standards, and frankly… just isn’t cool to run on your computer anymore.